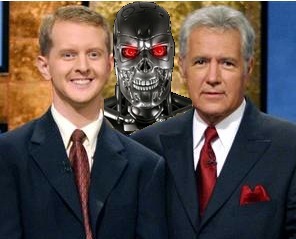 Ken Jennings, who won 74 games in a row, and Brad Rutter who won the most money in Jeopardy history suffered defeat to Watson yesterday. During a practice round, Watson earned $4,400 while Jennings and Rutter each earned $3,400 and $1,200 respectively. So Watson did not exactly “destroy” the competition but then again, he was up against two of the best to ever play the game. Looking into the brain of Watson, IBM wanted to make this contest as fair as possible. We all know how powerful of a tool Google is, therefore Watson is not connected to the web. That would be like cheating. Simply put, Watson is an encyclopedia of information. Whether its music, sports, history, technology, or literature, it’s most likely in Watson’s brain. His actual brain is comprised of 4 years of work from the IBM team and 10 racks of Linux servers. While IBM has invested a great deal of time on this project, their vision is not to create the ultimate jeopardy machine. They hope the application can be used in many different industries, including the ability to provide physicians with a vast amount of resources to allow them to make a more educated diagnosis in a smaller amount of time. For now though, Watson will be limited to a Jeopardy match which will air on television February 14 through the 16th.